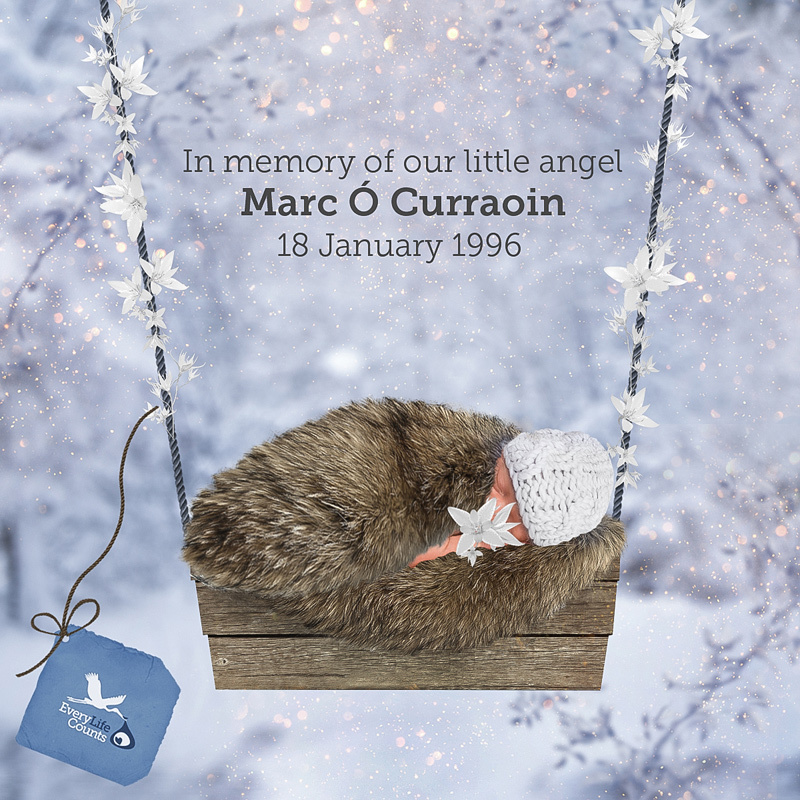 "We have the sure comforting knowledge that we did all we could to give him life"
Whenever we are asked how many children we have I often reply that we have one little boy, Marc, and two young ladies. 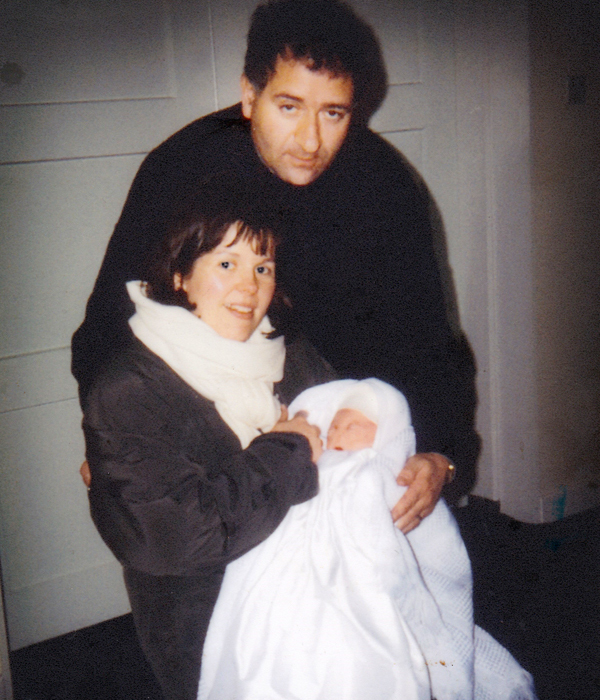 Marc was our first child, our only boy. He was born at 37 weeks gestation, though we knew at 24 weeks that he was in serious difficulty and would not live long after birth. At the 24 week scan the doctor explained that there was very little fluid around our baby, that fluid was building up in his body, his kidneys were not working properly or at all. He had hydrocephalus. I understood that babies can survive with this condition and asked what I could do to help his situation. The story got worse. 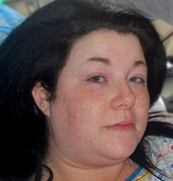 He also had anencephaly, where part of his brain had atrophied. Kindly and carefully the doctor told me this baby could not survive outside the womb. This is devastating news for any parent. My immediate response was "what happens now?" The doctor told me that our baby was alive and protected, and, that while he didn't expect our baby to survive to full term, the longer I carried our baby, the easier it would be to deliver him. We were advised to come back in a fortnight for another scan at 26 weeks. We were shocked, heartbroken, devastated and stunned. By the time we went for the 26 week scan I was convinced the doctor had gotten it all wrong, wrong scan, wrong baby, wrong diagnosis. We were allowed to see the scans again and there was no way we could deny the facts before us. 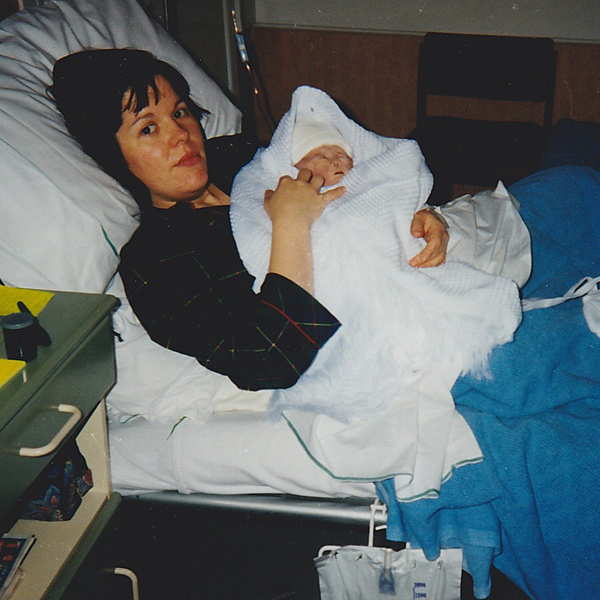 The doctor gently told us that I was this baby's life support machine, once we were separated, his death was inevitable. We prayed and prayed. We asked God for a miracle, a cure. We bargained with God to let this baby live. We would be his kidneys. Whatever parts don't work, we would compensate. We had fortnightly scans and I could feel our baby kicking, as if sending me the message "Hang on in there Mom, I'm not gone yet". 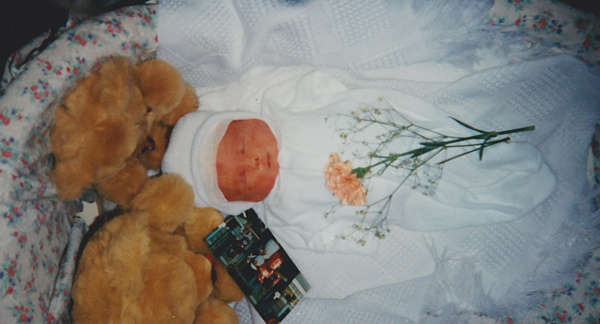 We were very aware that this was our baby's precious lifetime. At 36 weeks, time was running out and we opted to deliver at exactly 37 weeks. Being told that he would not survive a natural delivery we chose a C-section to give him the best chance of being born alive, to meet us, see us, to know who to keep an eye on from Heaven. 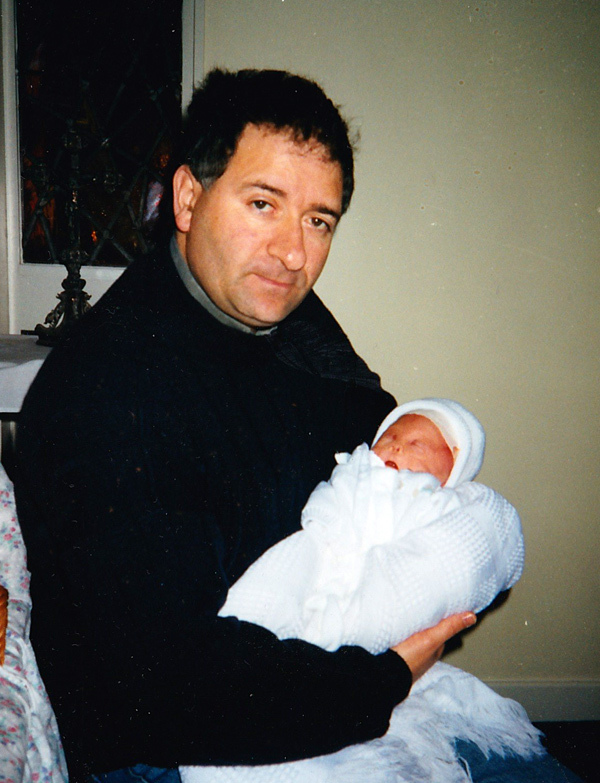 The hospital Chaplain was in theatre also and baptised him in my arms and he died immediately. Our faith really saw us through this toughest of times. Ar dheis Dé go raibh sé. The compassion of the hospital staff was palpable. They did all in their power to support us and carry us through, as did family, friends and community. 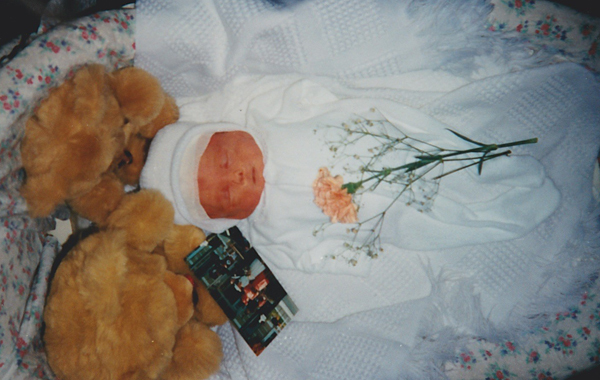 We spent ten days in hospital gathering precious memories that would have to last us a lifetime, photographs, footprints, handprints, a lock of hair. We talked and sang to him and then planned his funeral. It was January, mid-winter and it was bleak. The trees were bare, it was frosty and cold. Before Marc was born, one day I was looking out of the window in our sitting room and spotted little white snowdrops peeping above the hard and cold ground. They gave me such hope.... a promise of Spring, life, growth despite hardship. Marc was born a week later and we thought of those pure white flowers in our garden. It would be very symbolic for us to pick some and lay them on his grave after burial. But the day of his funeral, the green fields in our locality were under a very thick blanket of snow, so much so that those small flowers were totally covered. But he got snowdrops on his grave alright! The snow drops came down heavily, causing the officiating priest to comment that it was fitting the landscape be white and pure, just like the soul of the baby. Marc had a most beautiful funeral and was laid to rest in our local cemetery. Our greatest comfort now in the face of what was undeniably a tragedy, is that we didn't hurt him and he didn't hurt us. When we look back now at our time together 20 years ago, we are very glad Marc was so protected by the Irish Constitution firstly, by the medical profession, by family and friends and the community. Not one person suggested any other manner of handling his life and difficulties than the way they were handled. 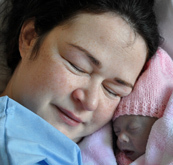 It grieves us to hear that awful expression, "fatal foetal abnormality". 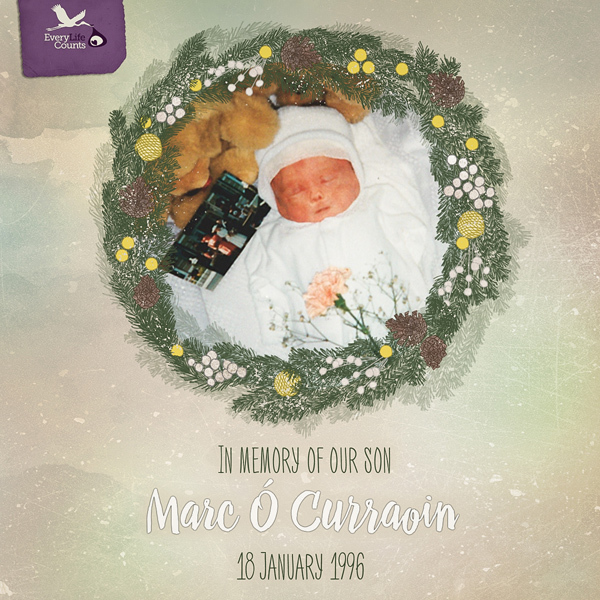 Marc was only ever referred to as a "baby in difficulty", which is what he was. It grieves us also to witness the massive push to legalise abortion in Ireland, allowing the destruction of life at its most vulnerable stage. I am the mother of a dead baby. I know that raw ravaging pain. It is terrible. Yet we have the sure comforting knowledge that we did all we could to give him life. 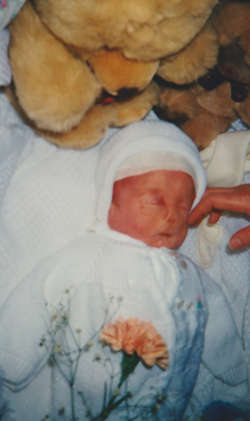 Twenty years have passed and we find the push for babies such as Marc to be aborted very alarming and very upsetting. On his birthday every year we celebrate Marc's life. We stop work and school and take the day to remember, honour and celebrate what he has done and been for us. In our kitchen, Marc's framed photographs and footprints hang on the wall, foot prints of feet that never hit the ground, a voice that never spoke a word. Yet by his life he has had a greater impact and influence on me, on us as a couple and as a family, individually and collectively, than any other person that ever lived. Marc's life and death have purpose. "Our greatest comfort now in the face of what was undeniably a tragedy, is that we didn’t hurt him and he didn’t hurt us."